All residents age 18 or older and nonresidents age 16 or older must purchase and possess a sport fishing license to participate in Alaska sport and personal use fisheries. In addition, a king salmon stamp is required to fish for king salmon. These laws apply in both fresh and marine waters. Sport fish licenses and king salmon stamps may be purchased online, at most sporting goods stores, and at Fish and Game offices. Alaska residents age 60 or older and Alaska disabled veterans who maintain their residency may participate in sport fisheries without a sport fishing license, but must apply for and possess an ADF&G Identification Card. 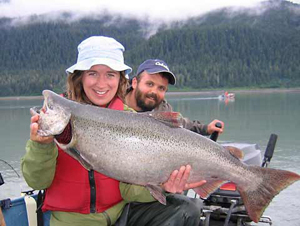 Alaska Identification Card applications are available online and at Fish and Game offices. Holders of ADF&G Identification Card and resident anglers under 18 years of age and nonresidents under 16 years of age DO NOT need to purchase a king salmon stamp in order to fish for king salmon. To participate in sport fisheries that have annual harvest limits (many king salmon and rainbow trout fisheries, see the Sport Fishing Regulations pages for the location you will be fishing), resident anglers younger than 18, nonresident anglers younger than 16, as well as resident senior and disabled veterans holding ADF&G Identification Cards must obtain a free Sport Fishing Harvest Record Card (PDF 108 kB), available online, at license vendors, and at Fish and Game offices, in order to record their harvest of those fish. You need to carry your harvest record card with you while fishing and record your catch immediately in the field, but do not need to turn in your card at the end of the season. Please retain your harvest card until the end of the fishing season.